First spotted back in October in a render that showed its black version, the unannounced Microsoft Lumia 650 can now be seen in another image. This time, we get to take a look at a white Lumia 650 - which isn't too different from the black variant (save for the lighter paint job, of course). Codenamed Lumia Saana, the 650 could become Microsoft's fourth Windows 10 handset, after the Lumia 950, Lumia 950 XL, and Lumia 550 (all of which are already available to buy in select markets around the world). 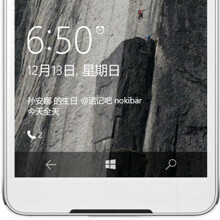 Apparently, the Microsoft Lumia 650 sports a 5-inch display with 720 x 1280 pixels, thus being larger than the Lumia 550 (which offers a 4.7-inch 720p screen), but smaller than both the Lumia 950 (5.2-inch Quad HD) and Lumia 950 XL (5.7-inch Quad HD). Other than that, there are no details on what else the upcoming smartphone will bring, though it's probably safe to assume that the rest of its features aren't particularly impressive. While there's no word on when Microsoft is planning to release the Lumia 650, it's likely going to happen soon. We'll obviously let you know when we have new info about this handset. I see some new approach in this device. Seems like front duo or single speakers. The bottom looks like speaker grill. Will be interesting to see in real life. perhaps a 640 that wont be carrier branded. The 640 is such a perfect device. Polycarbonate is better. If my Lumia 950 wasn't poly, it would have dents and dings in it right now from a couple drops. Polycarbonate also offers wireless charging capability and generally better reception. I wanted to buy a Lumia 640 just to check it out. I wonder if I should still buy it; I don't like how this device looks and 410 does not offer that much of a difference. The device is great. When you figure the price at 50 bucks or so, with LTE, 5in 720p screen, sd card support for full app install, great battery life. It is really really hard to beat. Other than the OS that many may not like, it feel it is just simply perfect. Everyone I have gotten the phone for, simply loves it. The closest thing is the Grand Prime (from carriers that is) that costs over 150$. I do like the Blu One X is probably the only thing for price that I would consider over this.